Always an extremely modest and highly charismatic figure, Sir Adrian Boult seems to hold that aura of invincibility about him. He was not invincible in a ruthless way, a' la' Karajan, but rather in his own docile and honest to goodness disposition, he was still tantamount to mesmerize anyone who came in contact with him. This fascinating recollection of essays, radio talks, speeches and other narratives shows him at the best of his highly objective literary talents. 'On Conducting' is a marvellous chapter, full of extremely interesting anecdotes and recollections that make one yearn for those far-off days. The association with Elgar is also highly readable with Boult's unashamed adoration of his great mentor poured into every sentence. The associations with Vaughan Williams and Holst are also important testimonies of Boult's spotless and tireless championing of British music in general. However, the conductor speaks with earnest and apparent loyalty about German and other music, so he cannot be class-bracketed into a provincial slob. The sterling work with the BBC orchestra is one of the salient points of the book. In his curiously matter-of-fact way, Boult has us believe that he just did a normal job but the accolades and adventures of his writings reveal the real heroic nature of the actual history of the orchestra. The sincere tributes and haunting radio talks on the death of great musical figures also make for some highly poignant reading, I particularly enjoyed the one on Vaughan Williams written on the day after the composers' death. Boult was a conductor through and through and when he spoke of his rivals or mentors it was always with a great sense of fairness and affection. The Toscanini passage is a constant flow of admiration for that gigantic figure and the accounts of those famous mid-30's BBC rehearsals makes the mouth (and ears!) water, such is their exciting subject. The accounts dedicated to Arthur Nikisch and Bruno Walter are also essential reading, primarily for their incomparable study of technique and the conductors' 'power of suggestion'. Two of the most important and essential parts of the book must be the dissertations dedicated to Elgar's 2nd Symphony and the Schubert 'Great' Symphony. Both were works for which Boult preserved special affection, indeed his recordings of the former work have more than reached cult status. Articles devoted to Vaughan Williams' 'London' Symphony and 'Job' are also indispensable reading to learn and gather knowledge about the enigmatic fundamentals that lie behind their origins. The articles on Bach and Brian are also highly informative as are the numerous small anecdotes and appreciations dedicated to performing artists such as Yehudi Menuhin and Pablo Casals. Boult's debt to Sir Henry Wood is also evident in his sincerely heartfelt appreciation of the Maker of the Proms. Another highlight is the general essay, 'On Music', a profound delivery of a master to all us students. Indeed, one of the finest books in the Musicians on Music series and a tower of strength for the continued revival in Boult's vast and magnificent series of recordings. 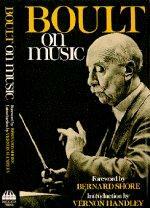 Compiled by two distinguished musicians***, both of whom worked closely with Sir Adrian Boult, this is a collection of a lifetime's reminiscences and observations by one of the greatest figures in British twentieth century music. Bernard Shore, himself the author of a celebrated 1930's book on the orchestra, was Boult's principal viola in the BBC Symphony Orchestra, while to Vernon Handley has fallen the mantle of advocate and champion of British, or even more particularly English, orchestral music of the kind that most appealed to Sir Adrian. To a generation who, apart from listening to definitive recordings of Elgar or Vaughan Williams, made towards the end of his long career, but who otherwise could never have had the opportunity to hear him speak or observe the familiar figure on the rostrum, this book night not have quite the impact it undoubtedly has on others who remember him in the flesh, As Vernon Handley warns, a miscellany of this sort might appear a trifle disconnected. However, to all who knew him in his day, listeners, students, young conductors, composers, and perhaps most of all orchestral players, his words and precepts were familiar indeed and they are all recounted here most vividly. This reviewer first played for Boult in 1942 at a war-time concert in the Royal Albert Hall, a first impression that has remained vivid ever since, and which is reinforced by reading the many anecdotes and observations that Boult made in radio talks. His rehearsing method was consistent, and at least to British orchestral players, logical insomuch as he exhorted his players to sense the architectural shape of the music first of all rather than fuss over tiny technical flaws that could safely be left to the individual to sort out for himself. Boult's comments on a multitude of topics are revealing, especially as might be expected on the art and craft of conducting. He obviously had personal preferences and enthusiasms, particularly the reverence he felt for Arthur Nikisch, his own mentor as a young conductor. His courteous, gentlemanly manner was legendary, although sometimes reading this book, the impression might be that he was too polite and uncritical; but this would be a mistake, for he could be aroused, if not to towering rages, certainly to much displeasure and annoyance when irked by the occasional awkward uncooperativeness of a player. There is also a quality, perhaps not to be fully savoured by today's reader, of a certain refined "BBC speak" of the 1930's, redolent of the cultured style of a BBC announcer of those days. His choice of topics also reflects to a large extent the people - conductors, soloists or composers - whom he was especially drawn to; quite often these were persons not all that well-known to present day or younger readers: Casals, Kreisler, Sammons, the Busch brothers or Eric Blom. His practical advice and comments to young orchestral players themselves aspiring to be conductors, was generous and encouraging; while to the relatively unknown composer whose work he was conducting for the first time, he was patient and indulgent towards their requirements. He once remarked .... "Ah! a little mistake in the parts, his copyist has let him down!"... not letting on to the orchestra that it was really the composer's own slip of the pen, and thereby saving the composer himself acute embarrassment in front of all the players. This is really a bedside book, to dip into as the whim takes one, rather than an earnest dissertation or manual of learning to be studied in great depth. Its charm lies in its engaging tone of pleasant reminiscence, although some readers night wish for more in-depth comment about certain things, perhaps especially an assessment of some of the other conductors of the times or observations about composers such as Bax, Bliss, Walton, Moeran; or composer-conductors of distinction, like Hindemith. The book is a comprehensive survey of English music of the period. A teasing caricature of Boult, by Gerard Hoffnung, once showed him on the rostrum, shackled by hand-cuffs and a ball-and-chain, as if to imply that Boult lacked passion and energy. But this was wholly misleading, for his distinction came not from such outward displays of showmanship (such as characterised Bernstein's circus-master tricks) but through profound and serious musicianship and the rejection of empty outward show. Orchestral players never had a bad word for him - and that is saying something.